Do you want to start getting to know all the animals who make our Savannas Preserve State Park Education Center their home? The animals featured on this page provided their stories so you can start to understand just what makes them so special. If you really want to get to know these fascinating creatures, come to the Education Center and meet them for yourselves. Hello, we are Leroy and Olga, the Florida box turtles of the Ed Center. We love it here! We are in our nice habitat of dry grass, with a dish of water to cool off in. All box turtles, including us, have highly-domed top shells and hinged lower shells that act like door hinges to let our little head and legs in and out. We can totally withdraw ourselves in our shells for protection, unlike our aquatic cousins. Our diet consists mainly of healthy foods such as fruits, flowers, mushrooms, worms and insects for protein! We love when the volunteers at the Ed Center bring us out to our turtle habitat. The Zammit family helped make an amazing pen so that we can have some outside time! Hi guys! I’m Cornelius, a red rat snake, also called a corn snake. Since living at the Savannas, I have grown to be over 6 feet long! I love to eat mice; they’re my favorite. I came to the center because I was almost going to be injured in an air conditioning unit when a kind human rescued me and gave me this special place to live. ​Greetings! 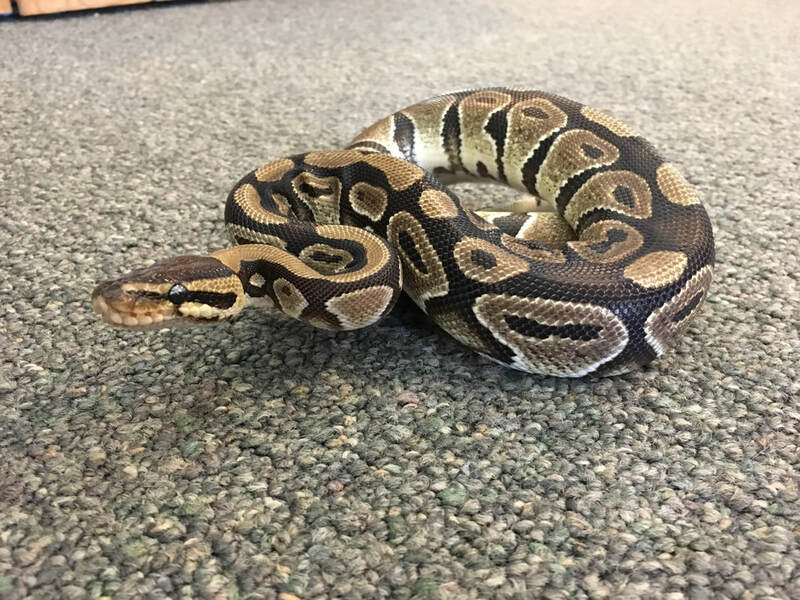 I’m Jinx, an African Ball Python. You might be wondering what an African snake is doing here…well, I’m what’s known as an Invasive Species or Non-native Species. Ball Pythons are commonly bought as pets here in the United States. The family that bought me didn’t realize how big I can get (over 4 feet long!) and knew they couldn’t properly take care of me once I got that large. Also, I can live up to 30 years in captivity. So my family decided to be responsible, and donated me here, where they knew I would be taken care of. If you come to see me, I’m usually curled up in a ball, under my hide. Hi everyone, I’m Sir Burps-a-Lot. Despite my name, I don’t actually make burping noises! I am a Southern Toad (Bufo terrestris), and I am capable of making a very high-pitched whistling chirp. Although, if you visit me at the Ed Center, you’ll discover that I’m usually pretty quiet, and I’m very good at hiding. My relatives and I are often confused for the Cane Toad or Bufo Toad. But you can tell us apart by looking at the raised glands behind my eyes. My glands are oval-shaped, but a Cane Toad’s are much larger and triangular. 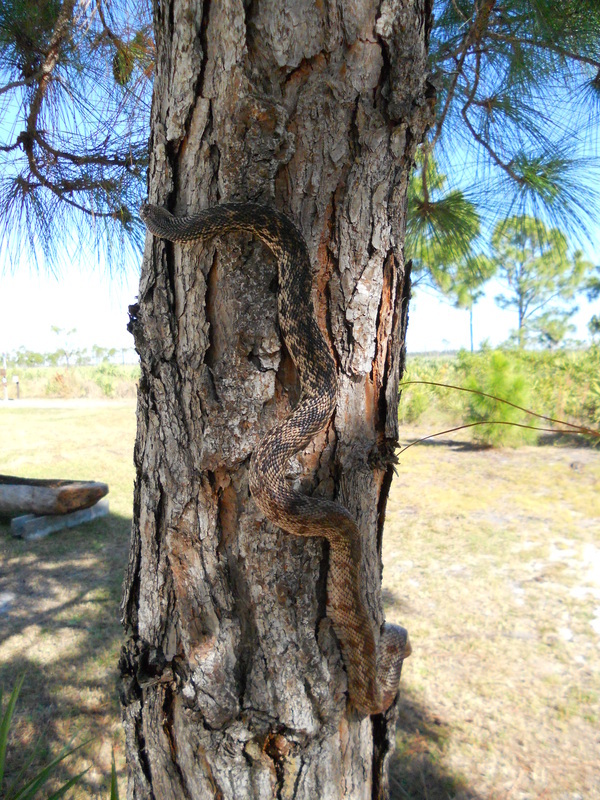 .Hi ya’ll, I’m Woody, a Florida pine snake. 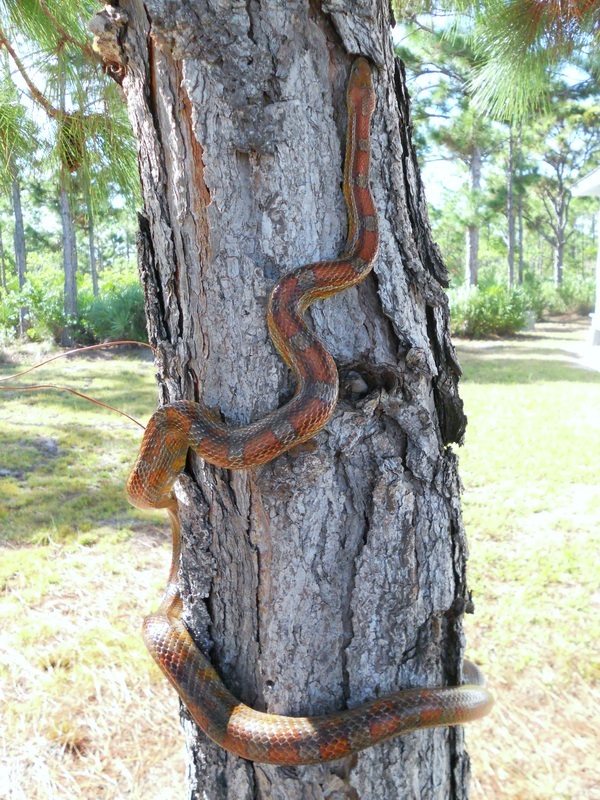 Similar to my comfy bachelor pad at the Ed Center, other pine snakes live in dry, pine-oak woodlands and pine flatwoods. I am active during the day, always trying to get out of my terrarium, especially when I’m hungry! Sometimes when I get disturbed I let out a light hiss, but not to worry I’m not venomous, merely voicing my opinion. Actually, my relatives and I get confused with rattlesnakes because we look alike and we both shake our tails but we do not actually have a rattle. Generally, though, I am a nice guy so come on over and see me! I am so excited that I just got a larger home with a wonderfully soft coconut fiber bed. I might be hiding in a burrow that I dug, so look closely.